One and a half hours of great Birthday Fun – all year round, whatever the weather! This will be the easiest party you have ever organised. These parties are Self Catered. We have a great brochure that tells you everything you need to know. 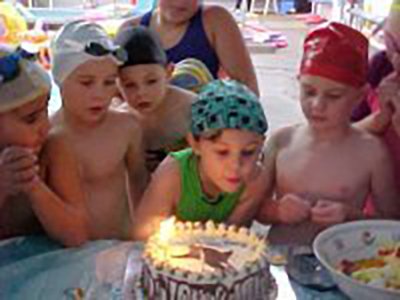 Call us to enquire about your next family birthday. Parties are available Friday & Saturday evenings after classes. Other times may be available during the School Holidays. p.s. 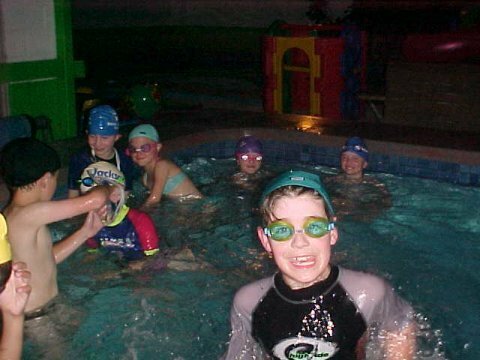 These parties are best for kids over the age of 7 years .. younger than that, and many of the guests tend to congregate in the small pool and not really enjoy themselves as much as they could. Swimming ability of all the guests should be considered when booking a Pool Party! From March to November we can offer you the ultimate pool party – a Disco Pool Party! Our Disco parties are brilliant fun – the atmosphere is electric!! The Mirror Ball, the flashing disco lights – what better way to celebrate your pre-teen’s party than with their very own Disco! Parties are usually held on Friday or Saturday evenings. (Times vary due to sunset.) Other times may be available during School Holidays. Total cost for the Disco Pool Party is $190 for up to 16 party goers. Final numbers MUST be confirmed prior to the party day. Disco Parties are reserved for “double figure” birthdays, 10 years and over! 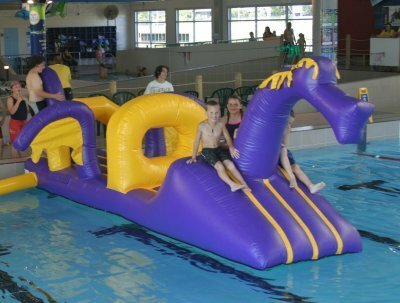 Lochie is our inflatable slide and guarantees you and your kids lots of fun in the pool at parties or group bookings. Made in and imported from New Zealand for your sliding pleasure, Lochie is already proving himself a great replacement for the old Crocodile Fun. If you would like to add some Loch-Ness Monster Fun to your Family Swim, it will only cost $20.00 extra!